I’m bustin’ with cabin fever, so looking forward to getting outdoors with my gardens. I have overwintered plants in my home and they are over-crowding their containers… really we are all so ready for spring. The weather has teased and tormented producing warm days and temps so cold I’ve procrastinated doing my outdoor chores. 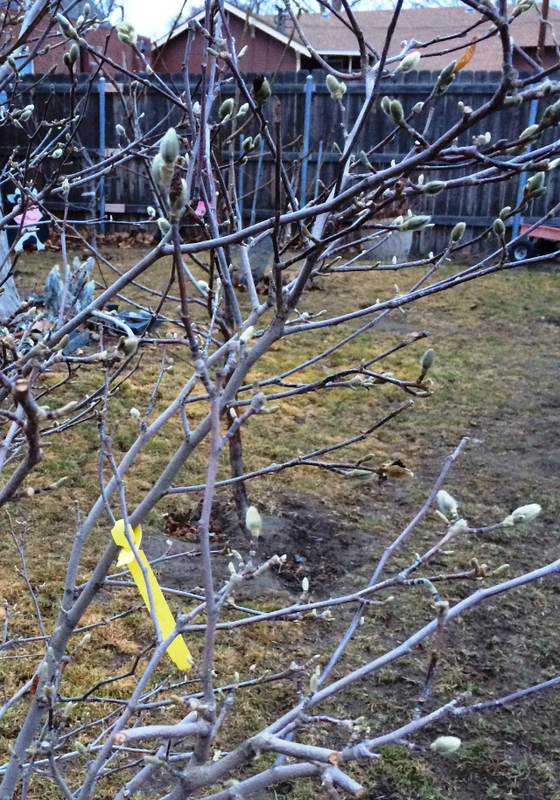 Last week I noticed buds on my Magnolia tree and on the fruit trees, a sure sign they believe spring is here, except it’s not; more freezing temps are expected. Regardless of my dislike for the cold protecting them is more important; I will be paying attention and prepared. I’m smiling… when my kitten waits on me to share my popcorn with her; in fact when she hears it popping she comes running. I’m smiling… when I dig up excess plants, trees and flowers and share with others. I’m smiling… when I hear my 2 year old grandson say “You’re welcome” as a response to his mother’s Thank you! I’m smiling… as I read about local kids excelling in school; education and sports. I’m smiling… as Simon (my labradoodle) brings me his Frisbee, nudges me & eager to fetch. I’m smiling… as a great furniture/ artsy ‘find’ appears for almost nothing. I’m smiling… as the number on scale reduces. I’m smiling… as a client goes in to rehab for alcohol treatment; the courage they have… I admire. I’m smiling… as I drive a new road and discover exquisitely designed architecture; maybe a new home for my office. I’m smiling… as my colleague’s eyes sparkle as she shares of a rock finding adventure. I’m smiling… as I’ve learned to say sure or give me a few moments, I’ll get back to you rather than an immediate ‘no’. I’m smiling… accepting my quirks allows me to truly connect with others who have similar quirks. I’m smiling… sharing conversation with others who are diverse in topic and beliefs and I learn and share. I’m smiling… as it’s OK to be ‘wrong’; it won’t be the first and it certainly won’t be the last. I’m smiling… a purchase order for a CD to replace an earlier copy I wore out. I'm smiling... when I witness little one's smile and laugh! I’m smiling... reciprocating is so important, without it I could be seen as self-absorbed. I’m smiling… to realize and remember when it’s flowing, it’s a go! When it’s not, it’s a no. I’m smiling… when I ask my fb friends to like my biz page and they do! I’m smiling… as I say and believe “it’s a God thing”. I’m smiling… when a new client ‘finds’ me. I’m smiling… ‘cause I feel so good when I’m smiling, I feel energized! I’m smiling… because you’ve taken a moment to read this. I'm smiling ... perhaps you're smiling too & make a "I'm smiling" list.